Even though I am not good about getting this fictional magical elf out of the box, I am good at hooking YOU up with a special Christmas present! Actually, two special presents for you. If you are interested in getting someone a very unique, and a very soft, and just COOL gift, look no further than Threads Local ! This company is responsible for the amazing shirts we had at United this year. They actually also screen printed our logo onto our environmentally friendly bags that held the swag, and onto the ridiculously cute notebooks that you hopefully jotted down your life changing notes onto. This wild design is available in Men's shirts and hoodies as well! 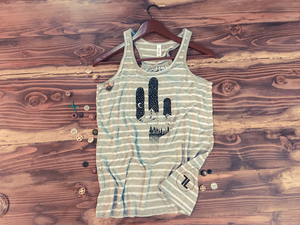 I have a thing for cactus, and stripes, so naturally I love this shirt. Oh hey now. What's this? 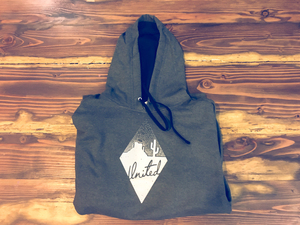 The super coveted United Hoodies??? YES! And you can order your very own RIGHT HERE, right now. And for 15% off! Use coupon code SHOWIT at checkout. The code will only be good for one week, so get on this ASAP Styles. She has been featured in big publications like InStyle and Women's Health, but she isn't too big to support little people like you and me! We were very happy to have her Head Phone Tacos in our swag bags at United this year. And she also gave us a special promo code just for YOU! Because she wants you and your stylish loved ones to have a very Merry Christmas. Shop her magical creations here and enter promo code ‘showit' at checkout for 10% off! I love this beautiful recycled leather pouch, modeled by our very own Elisa Watson! Look at these cute laptop cord holders! They're like a bra. Only for your laptop cord. Keeping things in place and looking good! Houndstooth! Be still my heart! This gorgeous crossbody comes in all kinds of amazing colors and different material options!